This chapter applies the empire model to what is arguably the first globalization episode: the creation of the largest territorially continuous empire that the world has so far seen, ranging from Korea to Eastern Europe, by a maximum of 1 million Mongols. 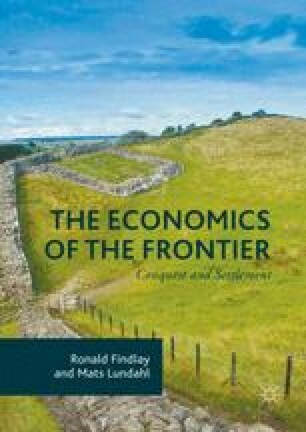 The chapter examines the Mongol choice between herding and conquest, arguing that for ecological reasons the marginal return to the former was exceedingly low, which made conquest the superior alternative. It also argues that the Mongol Empire was ‘too small’ in terms of military power, but ‘too large’ in terms of the capacity to administer it. Draft versions of this essay were presented at the conference ‘Asia, Europe, and Global Processes: Economic, Cultural, and Normative Dimensions’, at the National University of Singapore, 14–16 March 2001, in two seminars at the National University of Mongolia, Ulaanbaatar, at the Faculty of Social Sciences and the School of Economic Studies, 14 March 2002, and at the First SSAPS (Swedish School of Advanced Asia Pacific Studies) Asia-Pacific Annual Conference in Gothenburg, 26–28 September 2002. We are grateful for the constructive comments received on all four occasions, and to Stanley Engerman, for the same reason. The research has been funded by a SAREC (Swedish Agency for Research Cooperation with Developing Countries) grant, which is gratefully acknowledged. Revised from ‘The First Globalization Episode: The Creation of the Mongol Empire or the Economics of Chinggis Khan’ by Ronald Findlay and Mats Lundahl, in Göran Therborn and Habibul Haque Khondker (eds), Asia and Europe in Globalization: Continents, Regions and Nations, 2006, E. J. Brill, pp. 13–54. With kind permission of Koninklijke Brill NV.